Think daylight would look great in your home, but not sure where to start? Take the first step with a free, in-home consultation with your local Solatube Skylight expert. During this educational, no-obligation session, one of our knowledgeable daylighting experts will listen to your needs, recommend a customized lighting solution, perform a feasibility check, and provide you with a no-hassle quote. If you love what you hear, there’s no need to schedule a second appointment. We’re equipped to install your new Solatube Skylights right then and there. We don’t like to keep people waiting. At Sunshine Experts, we’re ready for anything. That’s why our factory-certified installation consultants carry the full line of Solatube products on their vans at all times. Want to get your new daylighting system installed today? We can do that. Eager to see all your Solatube Decorative Fixture choices? We can do that. Hoping to upgrade your system with a Daylight Dimmer? We can do that. 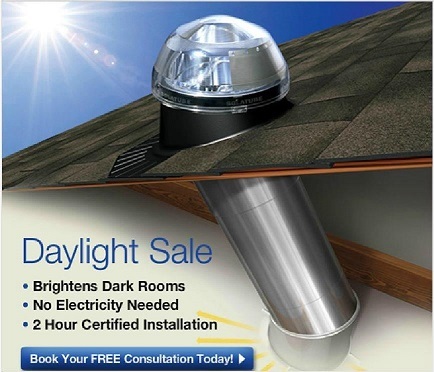 Sunshine Experts is proud of our Factory Direct Everyday Low Pricing we offer to our customers for a Solatube Skylight. We recognize that each application or installation is unique based upon the home structure. We would be happy to discuss pricing with you over the phone in order to customize your daylighting solution. For current pricing, questions, or if you would like to schedule a complimentary in-home consulation by one of our daylighting experts, please feel free to call (800) 786-4100. Solatubes are cost-effective. Tubular Daylighting Devices cost considerably less than other daylighting options, such as windows and skylights, including both product and installation costs. It can be installed almost anywhere. The compact and flexible design of TDDs allow them to be installed in just about any room, including rooms without direct roof access and smaller spaces where daylighting would usually not be an option. Call us to get an instant phone quote for your Solatube Skylight, we look foward to bringing natural light into your home. Heat and moisture are your enemies when it comes to your home. But just because you can’t see them doesn’t mean they aren’t there… hiding in your attic and causing damage. Solar Star Attic Fans neutralize moisture and drive out heat, keeping your home cool in summer and protecting it from harm during the winter. Call us to get an instant phone quote to cool your attic with our Solar Attic Fan, we look foward to cooling your home.